Saw this idea on the lovely blog of Claire - Gather to Keep. jars, wax, wicks, couches, guitars. Unless a rave is more your thing, then each to their own - but I'll leave that to your expertise of ideas. sitting under the trees where chandeliers hung and white paper cranes hung. yet it never eventuated in dancing. as Tracy Chapman pined on the record player. But there would be something marvelous about being above ground level. I don't own a practical roof of any kind so I'll just have to imagine. An affair on top of the world, almost like. i have the perfect roof for a party, though i don't like the fact that all my neighbours would see us... We've thought of watching a movie against a tall wall we have here, while being on the roof top... The only dangerous thing are the stairs... but i guess this is a damn good idea for the warmer weather coming! Thanx! I want this too. It all happens in my dreams. 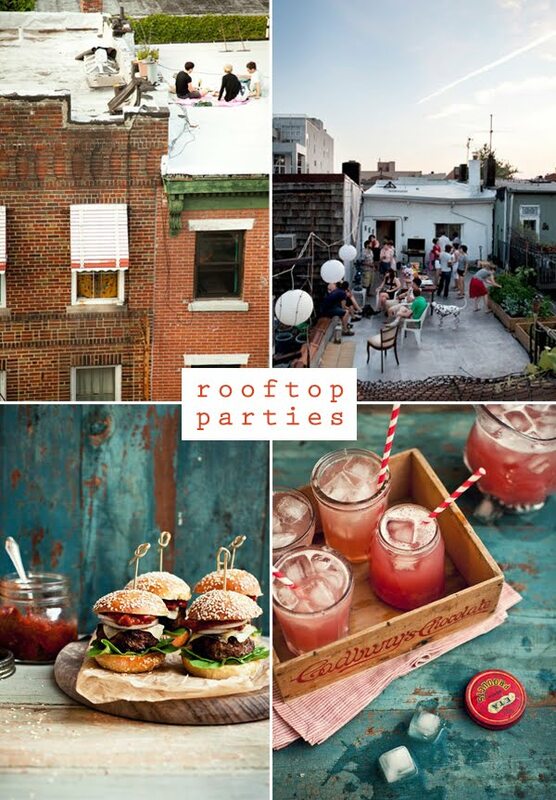 I love rooftop parties! Staying on the rooftop makes you feel fresh and free. What I like most about having a rooftop is that I can stay there all night long and wait til’ sunrise. Isn’t that a wonderful experience?